Click the Reports menu and choose the report to print. When the report is on the screen, click on Print. The Print form appears. To Print to paper, click the Print button. To “Preview” before printing, click the Print Preview button. Standard Reports can be set up to print / not print various items. To set up how to print, pull up the Standard Reports you want to print. From the Setup menu, select Report Setup. Similarly, new Custom Reports that you create (or edit from an available report) can be set up for printing. From the Report menu select Custom Reports and then click on New Report Layout or Edit Report Layout button. 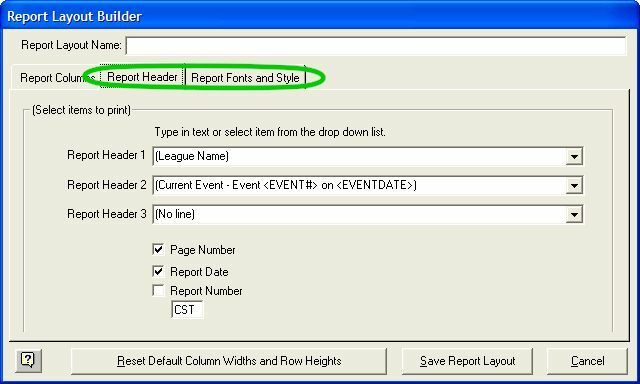 In the Report Layout Builder, click on the Report Header and Report Fonts and Style tabs and make your setup selections. If you are in Standard Reports or Custom Reports, click the Export to Html, Excel, or Text file button. League Manager creates an Html (web format), Excel (Microsoft Excel format), or Text (TAB delimited) file, which can be imported into most web pages, browsers, spreadsheet applications and word processing programs. If you are in Text Style Reports, check the “Print to file” option. Type the name of the file. League Manager creates an ordinary ASCII text file to use with a word processing program.